St Catherine’s Church, Fenagh, was erected in 1787 with the help of a gift of £360 from the Board of First Fruits, a body established in 1711 to construct and improve churches and glebe houses throughout Ireland; from 1777 supplemental grants from the Irish parliament fostered a nationwide programme of construction, enlargement and repair. The typical Board of First Fruits church is easily recognised by a standard design comprising a simple hall-like nave with a tower at the west end—in some cases the tower was a later addition. Describing St Catherine’s as ‘a plain edifice without either tower or spire’, Samuel Lewis in 1837 makes no mention of recent ‘gifts’ or loans from the Board of First Fruits, and Fenagh is one of a small number of churches in County Leitrim that survives more or less in its original form, with a nave and bellcote-topped porch. The Board of First Fruits’ successor, the Ecclesiastical Commissioners, supported the ‘improvement’ of St Catherine’s Church in the 1860s with the addition of a chancel, for which designs by James Bell (1829–83), Dublin, are in the Representative Church Body Library. The new addition allows the observer to see, in one building, the approach to Gothicism over the course of the late eighteenth and nineteenth centuries. Where the ‘pointed’ openings on the nave and their Churchwarden tracery fittings speak of the Georgian Gothic or ‘Gothick’ style, Bell’s chancel attempts to convey an archaeologically correct Gothic with a traceried east window modelled on medieval examples. The provision of St Catherine’s Church showed optimism regarding the status of Fenagh’s Church of Ireland community. However, having peaked at 121 in 1846, the Protestant population had dwindled to 53 in 1901 and to 26 by 1911. Parish reorganisation saw the church close in 1974 and it subsequently fell into disrepair. Restoration was begun in 1988 by a local development committee. The overgrown graveyard was cleared and its boundary wall mended. Some of the timber felled was used for roof repairs. Existing beams still in good order were retained, as was the slate finish. Apart from a new door, donated by the Knott family, all the original timber fittings were kept, including the characteristic Churchwarden windows. Repair of the bell completed the exterior restoration; work on the interior continued, including stencil work based on a template made from the original design. In 2015 funding was received from the Heritage Council under the community-based Heritage Grant Scheme. Floor replacement was completed in August 2015; impediments to the ventilation system that were causing the walls to become damp were rectified and the building was left for a year to dry out. Liaising with Leitrim County Council, the committee planned further restoration of the interior, and in 2016 funding under the Department of Arts, Heritage, Regional, Rural and Gaeltacht Affairs Built Heritage Investment Scheme (BHIS) and Structures at Risk Fund (SRF) allowed the conservation of the historic stained glass. There was great excitement on 20 July 2016 when the windows, restored to jewel-like intensity, were installed by Abbey Stained Glass Studios, Dublin. A carol service, the first church service in 21 years, took place in December 2015, while the first wedding in a generation took place on 22 April 2017. 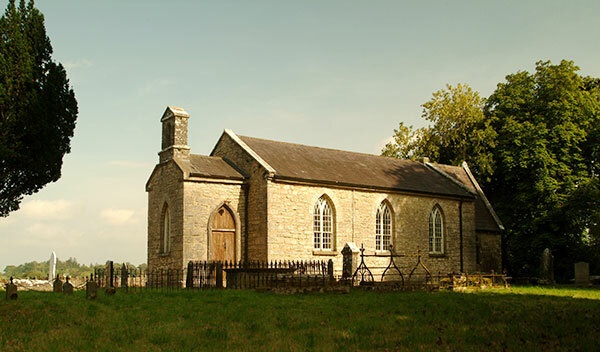 St Catherine’s Church is open to visitors, with the key available at the Fenagh Visitor Centre, www.fenagh.com. Julie Marshall is secretary of the St Catherine’s Church Committee. Series based on the NIAH’s ‘building of the month’, www.buildingsofireland.com.